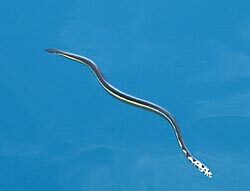 The Yellow-bellied sea snake has a paddle-shaped tail and distinctive colouring with a dark back contrasting with paler sides and belly in many patterns. Their average total length is around 1 metre. Their geographic range is wider than that of any other reptile species, except for a few species of sea turtles. It extends from the east coast of Africa, from Djibouti in the north to Cape Town in the south, across the Indian Ocean, the Pacific, south as far as the northern coast of New Zealand, all the way to the western coast of the Americas, where it occurs from northern Peru in the south (including the Galápagos Islands) to the Gulf of California in the north. This species lives in the surface layers of the open ocean and drifts passively in warm currents. It is quite helpless on land because their compressed shape makes them roll onto their side and sea snakes washed onto beaches during storms seldom manage to return to the sea. They feed on small fish only, which they make immovable with their venom. 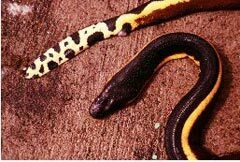 The yellow-bellied sea snake is about ten times more venomous than the Egyptian cobra (Naja haje) but it delivers a much smaller quantity of venom per bite. They hunt by cautiously approaching their prey or by waiting motionless at the surface and ambushing fish that come to shelter underneath it. With its mouth open the snake makes a rapid sideways swipe to snare any fish that comes too close. Unlike most other species of sea snake, the Yellow-bellied Sea Snake does not seem to have many predators. 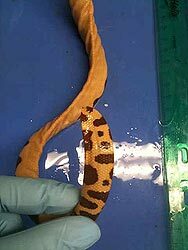 The bright colouration of this species serves as a warning, not only that the snake is highly venomous, but also unpleasant and possibly even toxic to ingest. They are capable of bursts of speed of up to 1m/sec when diving, fleeing and feeding. When swimming rapidly, they sometime carry their head out of water. Yellow-bellied Sea Snakes often are found in large numbers in long lines of marine debris. These “slicks” form in calm seas and consist variously of debris, foam and scum. In some areas, such as the Gulf of Panama in the eastern Pacific Ocean, the slicks can be from 1 to 300 m wide and many kilometers long. Several thousand snakes may be associated with a single slick. Females give birth to 2 to 6 live young with a gestation period of about 6 months. The young (around 250 mm in total length) are born with substantial fat reserves but they will feed on their first day of life. As Yellow-bellied Sea Snakes live in open waters they have little access to hard objects, such as coral, to rub against when the skin needs to be shed. Instead the snake uses a knotting behavior where it coils and twists upon itself, sometimes for hours on end, to loosen the old skin. The knotting behaviour also helps to remove organisms such as algae and barnacles attached to their skin. Most sea snakes are able to respire through their skin. This is unusual for reptiles, because their skin is thick and scaly, but Yellow-bellied Sea Snakes can obtain 20% of its oxygen requirements in this manner, which allows for long dives.